French Quarter Sees Violent Crime Surge; Residents Demand Changes The neighborhood popular with tourists is no longer an exception to New Orleans' stubborn crime rate. A recent run of robberies has residents criticizing city leaders and calling for more protection. 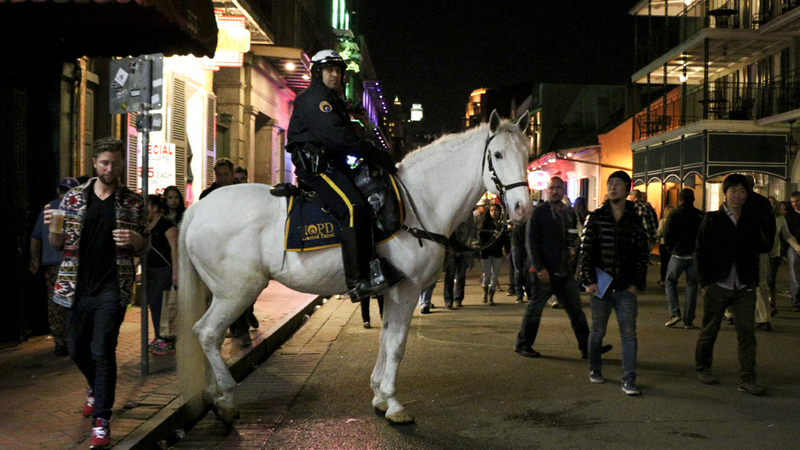 New Orleans police officer Patrick Schneider patrols Bourbon Street in the heart of the French Quarter on Saturday. New Orleans' most visited neighborhood rarely sees the type of violent crime that plagues other parts of the city. Recently, several high-profile robberies have rattled the region and led to criticism of the police department and the mayor, both of whom are rethinking safety measures. Over the next few weeks, more and more visitors will roam the city's famous French Quarter, drinks in hand, for Mardi Gras. In less than 2 square miles, the French Quarter combines hotels, restaurants, street performers, and all-night bars with historic homes and tight-knit neighbors. Now, some of the Quarter's iconic wrought iron balconies hold new signs that read: Caution. Walk in large groups. We love N.O.P.D. We just need more. Resident Bryan Drude got that sign from his neighbors, who printed hundreds of them, after a man was stabbed and robbed on their street last month. Drude wants more police on foot to protect tourists and locals. "We want the people that are here now to be safe. We don't want them to get held up or mugged, or stabbed or shot," Drude said. That violence would be "worse publicity to us than them seeing the signs." These signs are not the only public ploy to gain attention; French Quarter businessman Sidney Torres bought TV ads. His home was robbed last month. Then, this month, armed robbers attacked the bar next door to him. The ad announces: "The French Quarter is under siege by criminals. The problem can be fixed. It is only 6 blocks by 13 blocks. We should hold the administration accountable for the failures of not protecting the French Quarter ..."
After meeting with the mayor and the police chief, Torres has canceled the ads. The city has run its own sort of campaign, with podium speeches to highlight arrests and task forces. Introducing new police recruits, Mayor Mitch Landrieu addressed the French Quarter directly. "Recent upticks that have been plaguing the city have made people feel unsafe, and has reinforced our need to focus our attention. It's now more important than ever to have the best people, the best training and the best equipment," Landrieu said. Having enough people is the big problem. Years of attrition have dwindled New Orleans' police force. The city has upped its recruitment budget and says applications have risen 300 percent. But it still takes a year to get recruits on the streets. The city is also starting something called NOLA Patrol. The 40 or so uniformed security guards will walk the Quarter and work with officers. Landrieu also wants more state police. The current crowd seems mostly undeterred. Atlanta residents Anthony Mullins and Taylor Norman recently roamed Royal Street. Reading the "Walk in Large Groups" signs, Mullins, who works in law enforcement, said he understands people's fears. "I could probably agree with them. I would probably want to see more police, too. I mean as a tourist looking at it, it is alarming," Mullins said. The couple hadn't heard about the recent crime, but say it won't change their plans. Not so for Barb Kelly. Up in Alberta, Canada, she's been following French Quarter crime, in the news and on travel websites. She and her husband planned a 10-day trip in March. Now they're not sure. "It's a hard decision to make because I really do want to go back and see more of New Orleans. I loved it there, I really did. I thought it was a great experience," Kelly said. "We have to sit down and weigh the pros and cons." It's the kind of calculation that people who live, work and play in the French Quarter make every day right now. Deciding whether to stay for the band's next set, whether to walk a few blocks or take a cab. Asking who might walk with them, and how much risk is too much.